While many of us are well known to the fact that iPhones are way more thirsty for the juice than ever before and thus we need to keep an extra portable power source for emergencies. The concept of Portable chargers was very amazing Initially but there were many factors affecting the practical use but over the time ultimately we are seeing great improvements. Those of you who want to know basics about portable chargers and how they work please click here. We keep on updating the list of our Top Portable chargers list in regular intervals and thus you get the list of latest models to buy from. What are the best portable chargers for iPhones? The perfect fit for all the needs of any iPhone users. This portable charger is very lightweight and has a high capacity in overall power banks. The Anker is a leading brand in portable chargers section in the world thus has a huge technological advantage. Though it does not support Quick charge tech it has Anker’s power IQ tech used which enables it to provide high quality and fast charging support for iPhones and iPads. 20100 mAH is huge juice to keep you iPhones up for days. Also, it has 2 output ports thus you can charge 2 devices at a time and Charges iPhone 7 six times to get an idea. For Top 11 best power banks in general please visit here as this blog has overall list of quality power banks for all devices other than iphones too! The well-known brand in power banks has come up with this great capacity portable charger after big competition with Anker Power core 20100. This portable charger has 3 output ports so you can charge 3 devices at a time which is kind of ease while you are traveling. The battery capacity is huge to get an idea it can charge the iPhone X almost 5 times and iPad mini 4 two times. Though the battery pack has a bit of weight you can carry it in your backpack. The Li-polymer battery lasts quite well and you can rely on this charger for days. Another 20k capacity portable charger in our list. Though the Kamashi is not a very big brand they are coming up with promising power banks in the last 2 years. We have seen their 5k to 15k mAh capacity portable chargers and all of them were great. This particular charger has Quick charge support which means it can charge your iPhone really fast. Also, it supports Quick Charge 2.0 and Quick Charge 3.0 thus covers all the devices. The 20000 mAh Li-polymer battery has enough juice to keep the iPhone 6 and iPhone 6s charged up to 8 times. When we consider capacity wise mid-range portable chargers the Aibcon stands out with its low price and great quality. The power bank has anti-fingerprint skin which is good. The 10000 Capacity is not huge but gets the work done with iPhones by keeping them alive for the whole day. Though it has a flashlight it is not quite good in emergencies. The battery pack is small in size and easy to carry. Also, you will get 30 days replacement warranty which is actually a great point. We’ll start off our review of battery chargers with a rather budget friendly product. The “Omaker Intelligent Charger” model is a powerful device that has a capacity of 5,200mAh, which means that an average smartphone could be recharged a number of times with a full battery charger. It takes 3 – 4 hours to fully charge the battery charger, and the LED indicator will show you when it’s done. The “Omaker Intelligent Charger” model is a reliable and high-capacity battery charger. The Beautiful and elegant design of this model makes it look simply stylish and it goes with almost every design of your devices. However, while the cost to value ratio is rather good in terms of reliability and performance, it falls flat when you take into account that it simply feels somewhat cheap. This is not necessarily something to be worried about, but it still raises the question of the quality of the overall build of the device. If you’re looking for a cheap alternative that will get the job done, this is the battery charger we would recommend to you. OK, we’re stepping up our game here. This is a battery charger that makes a lot of things right. However, this comes at a price that’s much higher than the first battery charger we looked at in this review. It’s still bearable, but if you want to spend the least amount of money possible for a battery charger, this wouldn’t be the device you wanted to buy. On the other hand, the 3 ports, a capacity of 20,100mAh, and a comfortable weight of 377g (13.3oz) make the money you pay for it worth the while. The “RAVPower Portable External Battery Charger” model does a lot of things right. It costs a bit more than other similar devices, but it is definitely worth the buy if you’re looking for an all-around charger for smartphones and tablets of almost all kinds. The ultra-high capacity offers a unique experience of reliability and a safe feeling wherever you may end up going on your travels. The charging time of 4 to 5 hours may seem a bit much, but when you compare it to other devices that have significantly less capacity, it becomes clear that the time seems reasonable enough for such a performance. This is a battery charger that is simply designed with trips in mind. It has a unique design, which enables it to be hooked up to car chargers. Although its design is rather simple and minimalistic, it still manages to harbor 2 charging ports and a fairly lush capacity of 3,000mAh that can come in handy in many situations while on the road. The price is also in the mid-level area and it may be a good entry-level battery charger you can keep in your car in case you need it. The “Nomad Road Trip Car Charger and Battery” model is great for people who spend a lot of time in their car. With this in mind, it doesn’t make much sense to buy this battery charger for any other environment. Because of this niche aiming, the manufacturer had in mind when conceptualizing this battery charger, it is one of the best battery chargers for in-car use, but not really in a domestic or adventure environment. If you don’t have a car nearby, this battery charger is not really practical because of the small capacity it offers. Extremely light and slick in design. Good price to value ratio. Short charging time (2 hours). Variety of models able to charge. Low batteries are one of the greatest fears for most of us these days. Of course, in the grand scale of things, this problem might seem like a minor discomfort, but if you’ve ever been in a situation where it is crucial to have a full battery, you’d be surprised what having a recharged battery really means. Furthermore, we’ve become so accustomed to being reachable and reaching everyone from almost any part of the world, having a recharged battery all the time is not only convenient but can also be a bare necessity of sorts. This comes as no surprise. Modern times have changed. Before mobile phones were invented, we never thought about the concept of being reachable anytime, anywhere. With technological progress, our mindset progressed as well. Being able to reach friends and family wherever they might be has become a standard we simply live with, without really thinking about how it was before. That’s why an empty phone battery is a nightmare for most people. Luckily, technological progress didn’t stop with inventing the mobile phone. People tend to make their lives and the lives of other people easier every step of the way. That’s why today we have an ever-growing technological industry that seems to progress faster than we can comprehend. Phones become smarter and are not just used to make and receive phone calls. The first major breakthrough in communication after the invention of the mobile phone, was, without a doubt, text messaging. This little invention echoes through the concepts of modern communication even today. Text messaging made it much more convenient to reach people in an instant manner and without getting needing to have a whole conversation. Human language always tends to be as concise as possible, which means that text messaging (or instant messaging) is a logical step communication technology took on the way to the modern phones we have today. As phones became smaller and more sophisticated, it seemed as if there were no real problems or boundaries in terms of the device we hold in our hands. The main problem lied with the mobile providers who were just discovering what it meant to offer the best possible service. Phone batteries were still no issue. Phones were mostly still monochromatic, and their displays didn’t consume much power anyway. Furthermore, batteries were big enough to store a lot of power (the design features of mobile phones were still in the background of everyone’s mind). Functionality was important. The best phones were those that could make the most of the scarce coverage mobile operators provided. This means that phone manufacturers gave their best to provide you with service. Hence, the antennas of older phone models. As the technology progressed, more and more features were put into phones: color displays, polyphonic music and one of the biggest inventions of that time, phone cameras. Once people get used to their phones having cameras and color displays, the issue of battery life came up once again. Before, people were used to charging their phone’s battery in a matter of every 4-5 days. Now it seemed as if everyone had to get used to a new way of thinking when it came to charging his or her phone. As features of mobile phones became more and more sophisticated, their power usage grew exponentially. This led to drastic changes in the industry. No one wanted to buy phones with fancy cameras displays and all kinds of other gimmicks if it meant that they had to charge their phone as many times as twice a day in some cases. Compromises had to be made throughout the industry. However, in the end, everyone in the tech industry knew that this wasn’t enough. New batteries had to be invented in order to accompany the ever-growing power that phones consumed on a daily basis. After the old types of phone batteries became extinct, it was time to find a new way to store power on a daily basis, without wearing out the battery. Lithium-ion batteries were the answer. The old-fashioned Nickel Metal Hydride batteries, old phone models were equipped with, had one important and devastating flaw: every time they were recharged, they lost storing space, making them somewhat obsolete in the long run. The answer was either buying a new battery pack every time the lifespan of the battery came to an end, or to live with charging your phones sometimes even several times a day. Lithium-ion batteries didn’t have that problem. They could be recharged millions of times without losing their “spark”. Furthermore, they were much lighter than the old Nickel Metal Hydride batteries, which made them much more comfortable to wear. This all happened in the early 2000s, which lead many manufacturers to think about not only features but also the design of the phones themselves. They saw that people like lighter phones, which made them think about other physical features they could change. Since bulky wasn’t in anymore, the batteries had to become thinner. However, they still needed to store enough power for all the features contemporary mobile phones were equipped with. When we look at the evolution of batteries, we can track the evolution of the mobile phone design as well. Thinner batteries meant that they needed to be bigger in size. This lead to a trend of phones becoming bigger once again. While in the early 2000s smaller phones meant that they were “better”, by the end of the decade so-called smartphones took over. Bigger displays, better cameras, and louder speakers, all of these needed a power source that could handle usage over a longer period of time. However, there were other changes in the communication industry happening that had an influence on the phones (and batteries) we use today. By the end of the 2000s, the internet was being widely used. However, WiFi still wasn’t a thing as it is now. Being connected to the internet meant sitting behind your computer and looking at the display monitor. If one would say to me back then that I could have a phone in my hands and access with it the internet sitting in a cafe, I would find it hard to believe. However, 6 years later we don’t really think about the times without WiFi. Internet was, however, just another feature costumers longed for, which meant that manufacturers had to give their best to come up with a way of making batteries last longer. WiFi receivers in our modern day smartphones consume a lot of energy. You might be aware of it yourself. The battery really drains fast when your WiFi is active and you’re surfing the web. This brings us to today. We are aware of the battery lives of all of our devices. Today we don’t only think about mobile phones, but also about tablets, smartwatches, laptops, and even phablets (phones almost as big as smaller tablets). However, if you were to look at the small print of the batteries, you’d still find that they are Lithium-ion or the slightly newer Li-Polymer batteries. Don’t get me wrong, batteries have become much better at handling our phone’s power consummation when compared to the first Lithium-ion batteries, it’s just that our needs have steadily grown so that batteries simply couldn’t keep up with our demands. When phone manufacturers became aware of the hard truth (that batteries simply couldn’t keep up), they made a decision to put something else on the market. So-called battery chargers were conceptualized as separate external batteries you can charge with the same charger that you charge your phone with. However, this battery would then be able to act as a power outlet you could hook your phone on and charge it when it runs out of battery. Today, battery chargers have become a hit amongst those who travel a lot. Having a separate battery unit has become rather important in many situations. We’re not talking here just about you missing the latest episode of your favorite TV show while on the road. Battery packs can come in handy in more dangerous situations that can potentially have drastic consequences. People who get lost in the wild, or simply need to call for help, now can think ahead when going on potentially dangerous adventures. People who depend on their devices for work and other important activities, now have a way to oppose the dread of running out of “juice” in the middle of an important phone call or presentation. With this in mind, it becomes apparent that battery chargers or battery packs have to be not only able to recharge your device, but also to be as reliable as technologically possible. That’s why we’re going to take a look at some of the best battery chargers today and compare them. We hope this review will help you to make an informed decision if you’re in the market for a battery charger. Furthermore, we will provide you with information about the models of phones that can be charged with the models we’re reviewing here. Battery chargers can be extremely versatile in terms of capacity, charging time and the environment they’re meant to be used in. There are battery chargers that are great for the outdoors, with great capacity and a reliable build. 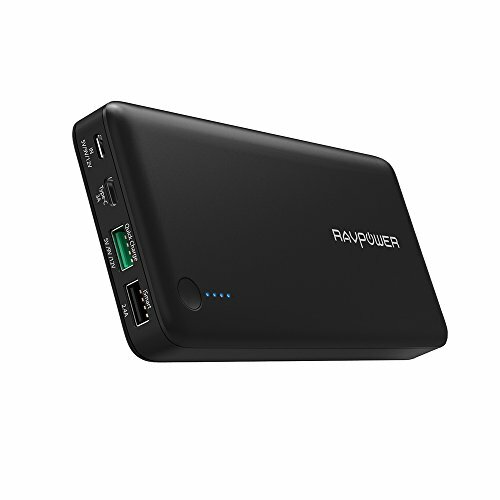 The “RAVPower Portable External Battery Charger” model is just one example of those battery charger models, however, this comes at a price that might be too high for casual users. If you’re on the road in your car a lot, the “Nomad Road Trip Car Charger and Battery” model might be the battery charger you’ve been looking for. It comes in handy whenever you need to charge your device, while on the road. The car plug-in design might not be much in terms of style, but it becomes apparent that this device is extraordinary when it comes to shining in the environment in which it is meant to be used in a car. A golden ratio between price, value, and performance is achieved with the “Omaker Intelligent Charger” model. It has a price that almost everyone can be OK with. To put it simply, if you have the money for a smartphone, you’ll have the money for this battery charger. Capacity-wise, this battery charger is rather good, although there might be some users who would find it a bit frustrating when compared to models like the powerful “RAVPower Portable External Battery Charger”. However, since we wanted to find a battery charger that is able to satisfy a wide variety of people, we think that the “Omaker Intelligent Charger” model is one of the best choices if you’re looking to buy a battery charger that’s reliable, has a relatively short charging time, and is able to charge a variety of devices. That’s why our pick is this battery charger, which will make your life a bit easier when it comes to the battery life of your devices. 2018 Bestportablechargerz.com Design. All rights reserved.